water by pints which would be nine ye first is ye strongeth. 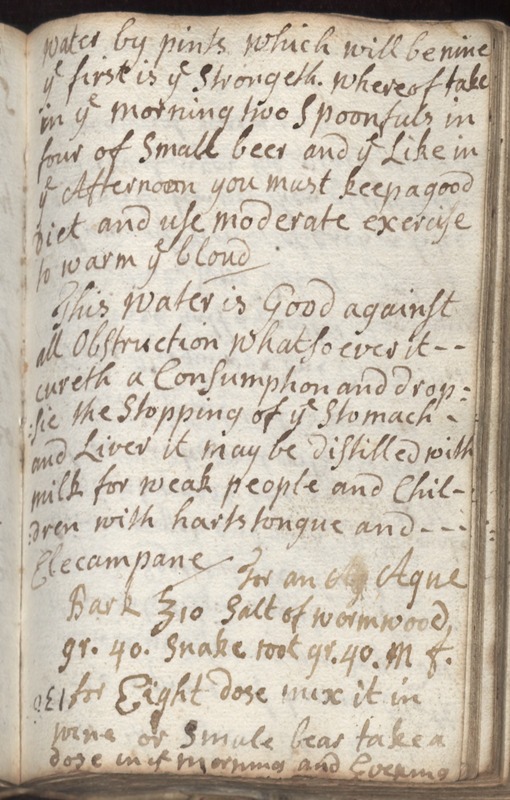 Whereof take in ye morning two spoonfuls in four of small beer and ye like in ye afternoon you must keep a good diet and use moderate exercise to warm ye bloud. This water is good against all obstruction whatsoever it cureth a consumption and dropsie the stoping of ye stomach and liver it may be distilled with milk for weak people and children with harts tongue and Elecampane. for an Ague Bark [? ]10 salt of wormwood gr. 40. snake root gr. 40. m of for eight does mix it in wine or smale bear take a dose in ye morning and evening.